WITH the 2017 season at its halfway mark, AFL.com.au reporters have turned their minds to naming each club's contenders for the Virgin Australia AFL All Australian team. Eddie Betts: The superstar forward is on track for his third straight All Australian jumper. The 30-year-old is third on the goalkicking chart with 32 this season, and he's also in the top 20 for goal assists. Sam Jacobs: The star ruckman is arguably having the best season of his career. Jacobs is leading the competition in hit-outs with 459 (41.7 per game) and is in the top-15 for contested marks. Rory Laird: An All Australian nominee for the past two years, the running defender is building a resume too good to ignore. He's first in effective disposals, fourth in disposals (347 at 31.6 per game) and fourth for rebound 50s. Tom Lynch: The high half-forward is having another consistent season, averaging 19.6 disposals and 7.1 marks per game. Lynch is also in the top 20 for goal assists. The former Saint was an All Australian nominee for the first time last season. Rory Sloane: The tenacious midfielder leads the League for tackles, he's fourth in contested possessions and seventh in clearances. But Sloane's influence has been blunted in recent weeks with teams employing a tagger on last year's All Australian vice-captain. Dayne Beams: Returning after 18 months out with knee and shoulder problems, the Lions' skipper is already back to his best. Brilliant inside and outside the contest, he's averaging 30 disposals. Tom Rockliff: A shoulder injury has halted his progress, but Rockliff has had his head down and bum up this season. One of the competition's best ball winners, he leads the AFL in average clearances (10). Sam Docherty: The Blues' defensive general leads the AFL in marks (95) and the club in kicks (216) and intercept possessions (68). Made the All Australian squad last year and has performed even better this season. Matthew Kreuzer: Faces stiff competition for the ruck spot, but is in career-best form. Plays as an extra midfielder after the ruck contest, using his mobility and athleticism to advantage. Huge work rate. Brodie Grundy: The young South Australian has developed into one of the most consistent ruckmen in the competition, impressing with his fierce competitive nature and ball-winning ability. Averaging 18.4 touches – elite for big men. Exhibit A was his effort to once again beat Giants monster Shane Mumford. Jeremy Howe: The Pies' best chance for All Australian honours, the high-flying former Demon has become one of the AFL's best intercept players and kicks off half-back. Averaging 21 touches and leads the Pies in contested marks, rebounds and overall game time. Scott Pendlebury: The Magpies' skipper has already entered the realm of all-time great and could be on the way to equalling coach Nathan Buckley's club-record six best and fairests. Averaging 29 touches, five clearances and six tackles and has helped lift his team over the line a couple of times. Joe Daniher: Daniher has spearheaded Essendon's forward line and is on track for a career-best tally of goals this year with 30 to his name so far. He has produced match-winning performances on several occasions and is rising into being a genuine star. Orazio Fantasia: Few would have predicted Fantasia to be in the frame for All Australian contention at the start of the season, but he has already kicked 25 goals (only Toby Greene and Eddie Betts have booted more as small forwards). Fantasia gets plenty of opportunities and makes the most of them. Michael Hurley: Hurley started the season slowly but his past six weeks have been excellent as he has regained top form. His commanding presence in defence and ability to cut off forward forays and start an attacking move for the Bombers has been excellent, and he is averaging more disposals (23 a game) than in his 2015 All Australian season. Bradley Hill: Had two quieter weeks against Carlton and Adelaide, but Hill's form before that helped revive Freo's season. The triple-premiership ex-Hawk's drive from a wing has been invaluable, and he's averaging a career-best 23 disposals and has booted eight goals. Lachie Neale: Was unlucky to miss out on last year's All Australian side after collecting a record-breaking 737 possessions and has become more damaging this season, slotting 11 goals while averaging 27 touches. Patrick Dangerfield: The football world would be staggered if the Brownlow medallist is not handed his fifth All Australian guernsey in September. Heads the Cats in so many categories – clearances, disposals and contested possessions – and is second in scoring involvements and metres gained with an average of 450.4 per game, and third for goals (22). Mitch Duncan: Much improved season from the 25-year-old, who is embracing more responsibility as an inside midfielder. Plays third fiddle to the 'Dangerwood' show, but deserves consideration for his first AA honour for his work at the clearances and also on the attack, while he leads his team for marks (83). Joel Selwood: Typically tough season from the captain, and possibly his best yet. Is averaging 29.2 disposals a game and is equal first with Dangerfield for tackles, plus the five-time All Australian is first at the Cats for score involvements. Gary Ablett: Has pushed aside the speculation surrounding his future to produce another terrific season. Now 33 and fresh off a second shoulder surgery, Ablett is racking up 32 disposals a game and is a driving force in any Suns success. Jarrod Harbrow: Has run into some off-field strife, but Harbrow is in the best three for the Suns this season. In the form of his career, the 28-year-old is locking down defensively, running hard and playing direct from the back 50. Tom Lynch: Not quite up to the same level as his 2016 season, but Lynch is still a towering figure in Gold Coast's forward line. Facing double-teams most week, he has kicked 25 goals and added 11 assists. 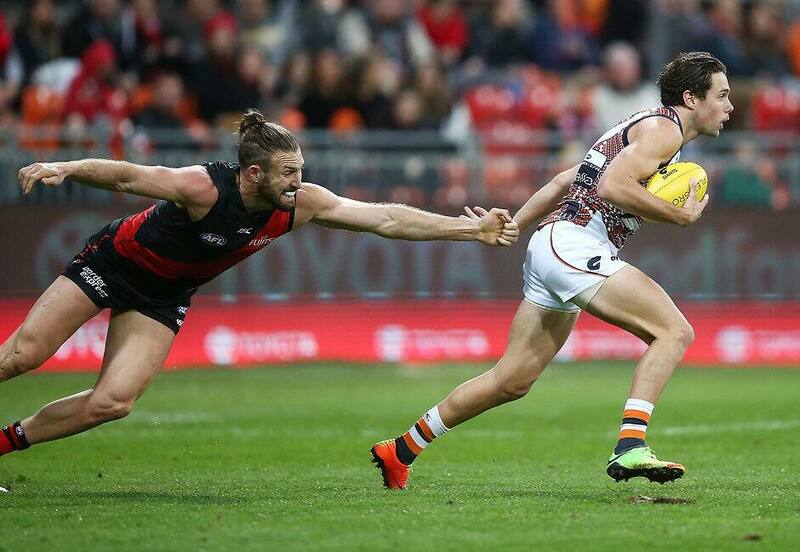 Jeremy Cameron: Equal leader of the Coleman Medal race with 34 majors, he's booted multiple goals in nine of 11 games and is on track to better the 62 goals he kicked when named All Australian in 2013. Phil Davis: The co-captain has taken on and beaten the best tall forwards in the game, with Lance Franklin, Tom Lynch and Charlie Dixon all quelled this year. Toby Greene: Has backed up last year's All Australian debut and club champion honours with another big season, and is on track for career highs in goals and goal assists. Josh Kelly: Despite the heavy media scrutiny over his contract status, the midfielder has launched himself into the elite bracket this year, averaging 29.4 possessions and 6.6 tackles per game. Shane Mumford: The most intimidating ruckman in the game has been exceptional again this year, with his physical presence a major factor in the Giants' ladder-leading season. Tom Scully: The gifted runner has averaged 23.9 touches off the wing and has continued to be dangerous offensively with eight goals from 10 games. Jeff Garlett: Garlett has put together a stellar season for Melbourne. The speedy forward has kicked a team-leading 25 goals in the most consistent season of his career. The small forward is also ranked second in the AFL out of general forwards for forward-half pressure points. Michael Hibberd: Missed the first four games due to an Achilles injury, but has been on fire ever since and has picked up where Jayden Hunt left off at the start of the year. The former Bomber has to be considered as one of the recruits of the year after averaging a career-high 28.8 disposals and an AFL-leading 7.3 rebound 50s per game. Neville Jetta: Criminally underrated, but Jetta is one of Simon Goodwin's most dependable players. The defender regularly gets the match-up on the opposition's most dangerous forward and has consistently curtailed their influence. Has also improved the offensive side of his game over past seasons. Charlie Dixon: The much-maligned key forward is starting to realise his immense potential. Leads the League in contested marks and is in the top 20 for goals (24) and goal assists. Brad Ebert: The 200-game veteran is having a career-best season, averaging career highs in disposals (27 per game) and tackles (eight per game). Extremely tough at the contest. Robbie Gray: An All Australian in 2014 and 2015 as a midfielder, Gray has turned himself back into a dangerous small forward. He's second in the League in goal assists to go with 24 goals in 10 games. Tom Jonas: The key defender is in career-best form. Jonas shut down Gold Coast star Tom Lynch in round eight and rarely has his colours lowered. Trent Cotchin: The captain is back to the 2012 form that saw him eventually awarded the Brownlow Medal, leading with his actions and playing a more attacking style. He leads the Tigers for tackles with 73 (No.8 in the AFL) and is standing up in big moments of games. Dustin Martin: A superstar of the competition, Martin has dominated games with his ball winning, strength in contests and attacking flair. Ranked top 10 in the AFL for disposals (29.9 a game), clearances (6.7) and contested possessions (14.5), and No.2 for metres gained (564.4 a game). Has kicked 16 goals (only Patrick Dangerfield has kicked more among the top-20 possession winners). Dylan Roberton: The intercepting backman is a gun at winning the ball and sending it forward. He averages 25.4 disposals and 485m gained per game. West Coast's Elliot Yeo is the only other general defender to rate elite for disposals, metres gained and intercept possessions (a general defender being anyone other than a key backman). Lance Franklin: On track for his seventh All Australian jumper after booting 32 goals from his first 10 games, and leads the competition with 9.5 score involvements per game. Josh Kennedy: The skipper has maintained his high standards despite his team's rough start with 29 touches per game, and is top five in the League for contested possessions and clearances. Josh Kennedy: West Coast's forward 50 supply has dried up this season, but Kennedy – who missed last round with a calf injury – shares the lead for what would be his third successive Coleman Medal with 34 majors. Jeremy McGovern: Earned a maiden All Australian gong last year and is enjoying another fine campaign. He is fourth in the competition for contested marks (24) and marks (87) and is the linchpin of West Coast's defence. Luke Shuey: The reigning club champion made the 40-man squad last year and is finding more of the ball, averaging 28 disposals. His clearance work (5.7), tackling (6.5) and pace are vital for the Eagles' engine room. Marcus Bontempelli: The 2016 All Australian and club best and fairest is borderline to make this year's squad. While he's averaging 23 disposals, six tackles and a goal a game, the star 21-year-old hasn't displayed the same form that saw him play a critical role in the club's premiership success. Luke Dahlhaus: The hardworking midfielder has been heralded as an All Australian candidate in recent seasons without getting any recognition. But by averaging 27 disposals and four tackles per game in 2017, the former rookie may finally get the nod.